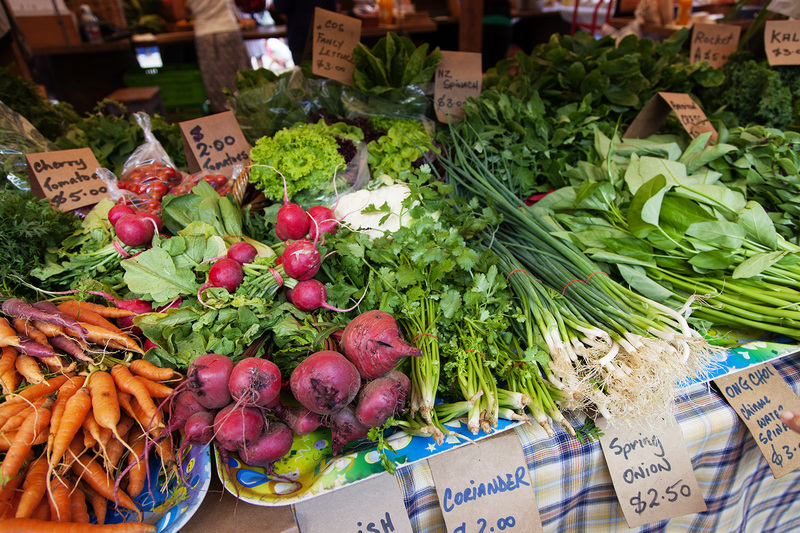 Held on Saturday from 8am – the markets are alive with organic, fresh produce and local artisan goods, ripe for the picking. You will find homemade pies, bouquets of local flowers, jams and jellies and Matakanas specialty – The Love Shack. This little boutique coffee shop uses their own coffee beans that have won numerous awards – Matakana coffee roasters (give the barista, girl with blonde curls, a friendly wave!). Relax by the riverside, enjoy live music and an array of cuisine. The markets are dog friendly with a stand at the entrance – get in early as it gets busy! 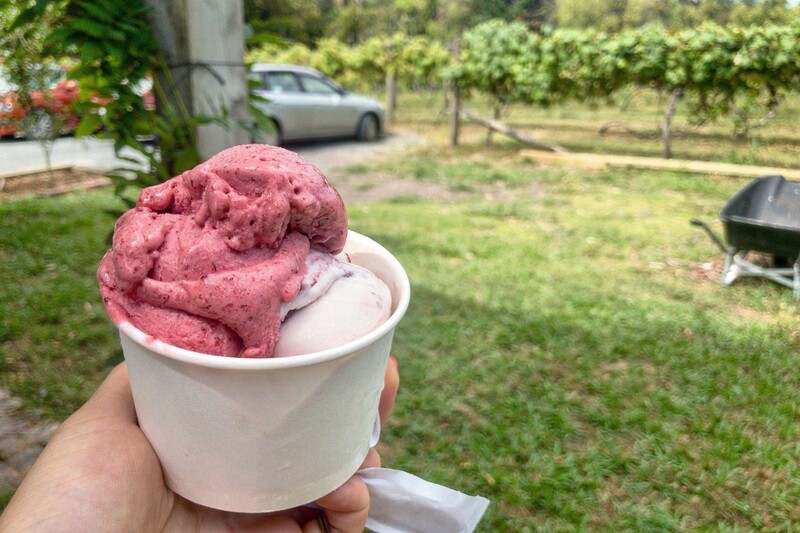 Delicious, fresh and organic blueberries or raspberries blended with frozen yogurt or ice cream, encased in a waffle cone (or swirled in a plastic tub). Cool little spot with woodfire pizza, and an outdoor area with lovely views of a vineyard. How good! The Matakana Oyster green shed – an absolute pearla that sells oysters fresh from the Mahurangi Harbour all year round. You will notice that the outside of the shack is littered with oyster shells, tribute to its popularity. Beautiful purpose-built gallery nestled across 3 acres of landscaped parklands. The Vivian presents internationally renowned and local arts in curated and group shows, as well as talks, performances and local events. The Vivian is currently participating in the Auckland Art Fair, held at the cloud until May 28th – so get in quick! The Sawmill takes pride in their craft beer, releasing monthly seasonal beers and holding multiple Brewers Guild Awards. The menu is designed to share with friends, with a focus on nibbles and platters, created with local, sustainable, free range and seasonal produce. One of the larger Islands in the Hauraki Gulf, Kawau Island is a quiet, isolated haven with no roads, beautiful bays and historical landmarks. The clear, calm waters are great for snapper, kingfish, kahawai and john dory. Kawau Island is reached by ferry that leaves daily from Sandspit Wharf, near Warkworth. Beautiful stretch of soft white sand and crystal clear water. Awesome place with crystal-clear waters and ample opportunity for snorkelling and kayaking (the place is littered with diving and kayaking gear for hire). There is a slight estuary that you can swim across before coming to an isolated Island that has heaps of cool exploring opportunities! Pack a picnic and make a day of it. If you’re thinking about getting into the snow season 2018 – spend some time here and practice! Snowplanet is an indoor snow centre with all the bells and whistles such as a rope tow and artificial snow. Between May and June Snowplanet is doing a Freestyle Friday special – entry is from $20 between 6pm-midnight, gather your friends and family and make an evening of it! Awesome little place to explore with walks that uncover Devonport’s maritime history – with a lookout point, bunker defence site and twin 6 inch gun forts, and more. The views are beautiful, spread across Auckland Harbour and Rangitoto Channel. Stroll around, explore, have lunch along the vibrant strip of cafes, and end the day with a swim at Cheltenham Beach. The houses in Devonport are super pretty – old villas that add to the village ambience. An absolute must do! BYO socks and jump for joy at this trampoline park! Every Sunday at 5.30pm the basement of the Glenfield Shopping Mall presents a wide array of street foods. There is ample choice of ethnic cuisines, particularly Asian flavours – recommend the pork dumplings! There are six sheep to every New Zealander so it makes sense to have a sheepworld. Discover rural New Zealand and how we farm our sheep, and harvest and use their wool. Cool selection of wildlife such as roosters, piglets and of course, sheep. 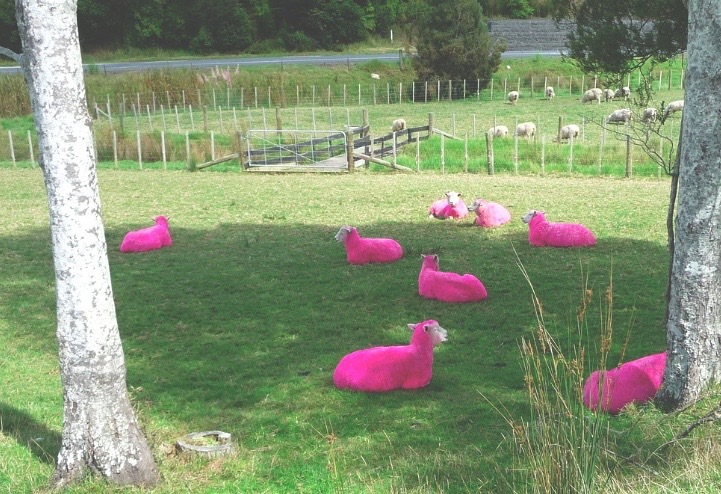 You may notice a couple of pink sheep – some artist has gotten creative with a can of spray paint that adds to the ambience of ‘sheepworld’. A must do! If you consider yourself a bit of a wine connoisseur, or a recreational wine taster, there are fantastic wineries such as Brick Bay and Heron’s Flight. Brick Bay has a lovely restaurant called the glasshouse that offers fresh seasonal produce and quality wine to match. The glasshouse is a gateway to the Brick Bay Sculpture Trail, a cool walk through nature that showcases 45 contemporary sculptures. Heron’s Flight is one of the few vineyards in New Zealand to specialise in the Italian varieties Sangiovese and Dolcetto, that also offers a beautiful dolcetto rosé. Herons Flight has a cellar door that is open daily for tastings. 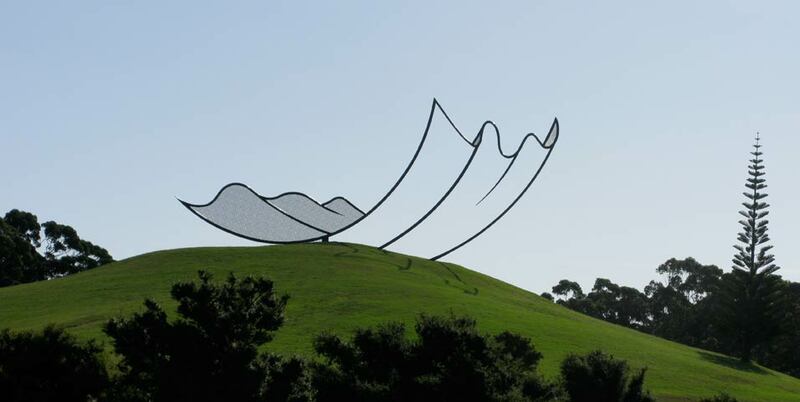 On Kaipara Harbour you will find Gibbs farm that has an eclectic display of sculptures sprawled across 400 hectares. The works in the collection are commissioned by some of the world’s most significant artists, many coming from New Zealand. The Farm is private property and open monthly by prior appointment. Cool little beach in the midst of Auckland. Lovely spot for a sunrise walk, followed by a coffee at Java Jungle Café. 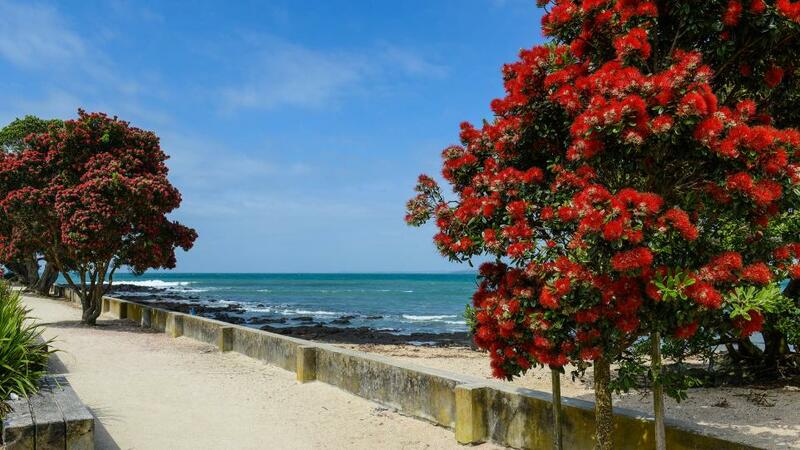 Sit underneath the Pohutukawa trees and enjoy the seaside breeze. Behind Takapuna beach there is a thriving hospitality scene with a variety of cafes, restaurants and bars that often have outside seating. I recommend Francs that offers bar-style-kiwi-cuisine, and trying the chilli caramel pork belly. An open sanctuary that integrates conservations, recreation and farming. There is a super pretty waterfall and numerous activities such as bird watching, boating, camping and diving. There are multiple tracks that take anywhere between 30mins to 2hours. Absolutely beautiful! Boasts some of Auckland’s most beautiful white sand beaches, rolling pastures, shingled bays and native coastal forest. Spend the weekend camping and explore the numerous walks and trails, swim in fresh-coastal waters and enjoy the natural beauty! Watch stunning rock pools form when the tide goes out. Ideal for swimming and snorkelling. There are numerous horse trekking companies north of Auckland and it comes down to where you want to trek, whether its Pakiri, Murirwai or Waiwera. Ti Tree Hills, based in Waiwera, is a short distance from central Auckland that offers great horse riding trails with spectacular views overlooking Hauraki Gulf, Hibiscus Coast beaches, Auckland City and Coromandel. Experienced guides will take you through kauri, regenerating native bush and beautiful ponga ferns. A black-sand-west-coast beach with awesome walking tracks that lead to panoramic viewing platforms of Muriwai beach. You will notice lots of Gannets – Muriwai has a gannet colony, with 1,200 pairs of gannets that nest here between August and March each year. Pack a picnic, go for a walk and watch surfers make the most of the west coast beach. Here you will find some magical architecture nestled amongst the trees. This was originally built for a marketing campaign for the Yellow Pages, which was open to the public as a restaurant, but is now only open for functions and small weddings (work doo or birthday anyone!?). Natural thermal pools that are sheltered by native bush and hills of Waiwera Valley – the perfect place to unwind and relax. All pools and spas contain natural geothermal water with a variety of indoor and outdoor pools, including a movie pool and water slides. There is also a studio gym, café and day spa. Puhoi Valley is created from locally sourced ingredients and their passion is reflected as a New Zealand renowned brand. 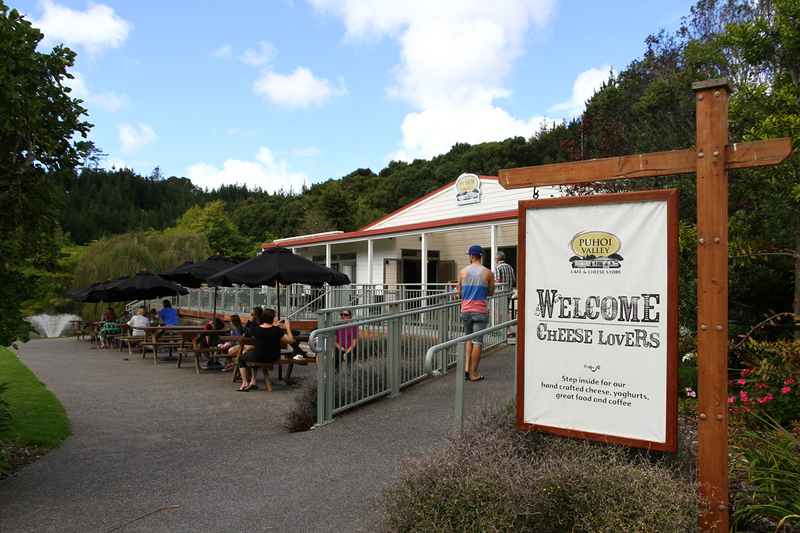 Puhoi Valley is both a cheese shop and café, and naturally their menu focuses heavily on cheese. Super beautiful location with outdoor seating, a lake, fountain and children’s playground. The honey centre uses the finest, locally sourced ingredients to make super delicious honey blends. There are on site colonies of honeybees, and a hive where you can see live bees! Cool stop off for quality, affordable honey, skincare and healthcare products, souvenirs and a cafe.